Ford spun off Visteon in 2000. The issues in the UK Visteon occupations hit close to home for long-time co-worker Judy and me. We are at UAW-Ford Local 600 (Ford Rouge) near Detroit where Visteon has closed plants. Fired Irish workers took over their plant after management gave them five minutes to leave. Instead, the workers put management out. Green Left Online wrote: “On the same day that Visteon sacked its Belfast workforce, it also fired hundreds of workers at two of its plants in England. After seeing the Belfast sit-in on the news, the workers in Enfield, north London and Basildon, Essex, organised occupations and protests at their factory sites.” On April 21, workers burned a mock court-ordered eviction notice. Enfield workers are no longer inside but massed around the plant. Irish sit-downers inspire British sit-downers… historic and inspiring! Encouraging union dissidents everywhere, striking shop-floor union reps publicly criticized top leaders for leaving them to sit outside the room where the union, Unite, is bargaining for better plant closing benefits. Ford-UK, like Ford-US, initially promised that Visteon wages and benefits would “mirror” Ford’s. The workers ended up with a broken mirror. By the latest layoffs they faced drastically reduced plant closing benefits and a pension fund crying broke. Sinn Fein’s publication, An Phlobacht, wrote of the Irish occupation: “Workers from Waterford Crystal in Ireland’s south, who began a seven-week occupation of their factory to save jobs in January, donated 5000 euros to the west Belfast workers.” Sinn Fein leader Gerry Adams prominently sympathized with the workers who are in his parliamentary district, but suggested that further action awaits a “united Irish economy”. The Independent Workers Union in Ireland, told the strikers: “The IWU congratulate you on your brave and principled stand. We wish you luck and success. You are an inspiration to workers everywhere. We extend our heartfelt support and solidarity”. Countering Adams, IWU president Patricia Campbell told us in an interview that international economic and political solidarity action with the sit-downers cannot wait. The proliferating spinoffs make it hard to say exactly who is part of Visteon, but workers connected the dots. Formerly Visteon German workers, now with a Dutch company, sent a solidarity letter. In the Detroit area, Judy and I initiated a solidarity letter (below) signed by a few active and retired, racially diverse Visteon and Ford UAW office holders. Sooner or later, occupying closed plants to demand severance benefits must become occupying open plants to keep them open. Workers may decide to run shut operations themselves. Others may look ahead and sit down to organize unions and win contract struggles. Workers need to look for rank and file leadership without borders. The Visteon UK actions come after occupations at Irish Waterford Crystal and by Chicago UE members. This does not make a wave of sit-down strikes. But if the Obama Administration can see “green shoots of recovery” for capitalism because bankers lend a few bailout bucks, maybe militant workers and socialists can say these sit-downs represent “green shoots of recovery” for the international workers’ movement. The undersigned Visteon, ACH and Ford workers and retirees demand that Visteon and Ford meet the demands of the Irish and British Visteon workers of Unite and other unions who are occupying their plants. This action recalls the best of U.S. workers’ history, from the Flint sit-downs that gave birth to the UAW, to the UE members at Republic Windows and Doors who occupied their plant and won their demands a few months ago in Chicago. Ford has followed a strategy of the spinning off its facilities into Visteon, and then the further selling or spinning off of even those facilities. However, all the workers involved still have common interests. Loss of pay and benefits in any part of the Ford Empire threatens every worker in it. This is clear from concessions by union members employed directly by Ford, as well as the negotiations over the fate of bankrupt Rouge Steel’s retiree pensions and other benefits. Ford retains overall responsibilities to all these workers. Ford must do its part in meeting the just demands of the Visteon and ACH workers, Rouge Steel retirees, Severstal workers, and the workers of Ford’s and Visteon’s other spinoffs, as well as the demands of direct Ford employees retirees. We have the Visteon workers in Ireland and Britain to thank for showing us that some workers are putting their working lives on the line to demand justice from Ford and its spinoffs. I think it would be of great interest to autoworkers in Canada and US. 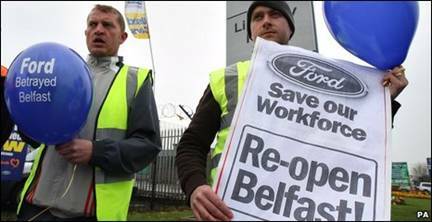 the news as of last night from the filmmaker, Sean, was that Visteon had suddenly conceded Ford terms + 33% on redundancy, though no move on pensions, that Basildon and Enfield had voted overwhelmingly to accept, that Belfast votes on Sunday – Belfast has a younger workforce and jobswere a bigger issue. The 3 occupations developed close links and the outcome if Belfast votes “no” is unclear. speculation was that the offer came as soon as the company realised the pickets were heading for Ford Bridgend.